Afobe has scored 24 goals this season including five for Wolves since moving to the club in January. 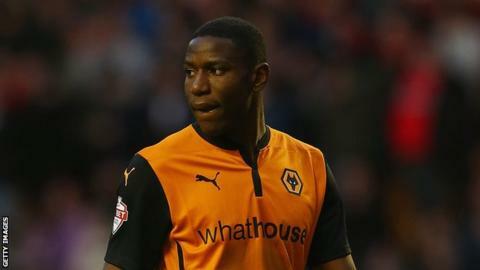 Striker Benik Afobe's brace helped a rampant Wolves maintain their Championship play-off push as they thrashed Rotherham United at Molineux. Wolves took the lead when Kevin McDonald crossed for Afobe to fire home before Nouha Dicko doubled their lead. Rotherham's best chance came before the break when Matt Derbyshire nodded Adam Hammill's cross on to the post. But Wolves capitalised with Afobe finding a second before Dave Edwards and Bakary Sako sealed three points. It capped off a good afternoon for the hosts who kept alive their play-off hopes but Rotherham slipped to 21st place, having now conceded 10 goals in their last three matches. A spell of early pressure told for Wanderers when McDonald managed to pick out former Arsenal trainee Afobe who kept his composure to beat Rotherham keeper Adam Collin. Minutes later, Wolves doubled their advantage when scorer turned provider as Afobe played Dicko through to notch his 10th goal of the season. But Rotherham fought back in a lively first half, with former Molineux man Hammill finding Derbyshire whose header hit the upright. After the break, home keeper Tomasz Kuszczak kept Wolves in control when Zeki Fryers whipped in a cross to the head of Derbyshire, but the Pole made a wonderful one-handed save. Wolves found a third on the counter from a Rotherham corner as James Henry set up the onrushing Afobe to calmly finish. The hosts did not ease off, however, as Sako whipped the ball to the near post towards Edwards who headed home a fourth. Six minutes later, Wolves were five up after Rajiv van La Parra passed straight through to Sako to beat Collin and put them out of sight. "In the first 30 minutes we played as well as we have done for months. We passed the ball well, controlled the game and the key goal in the Championship is the first one and we got it with a very well-taken finish from Benik Afobe. "We followed that up with Dicko's goal, which made it a very good start, and as the home side you are looking for that. "We were too loose after that and quite scruffy with our defending. That aside, after that period our play on the counter-attack was very good and obviously we were able to finish and go further ahead. "We went for it and we need to because we have to keep the pressure on what looks a very good top six or seven teams. A play-off place is realistic. If we can average two points a game between now and the end season we will be unlucky not to get in the top six." "Our defending wasn't good, our finishing wasn't good, so it is a bad day for us at the office. We have to go away, look at it, reflect on it and try to put it right, as that has not been like us in recent weeks. "We gave them too much time on the ball at different times today and I think all bar one they took every chance. "I don't want to stand here and be foolish and say we made six or seven chances ourselves, but we have and the difference is that they have been clinical and we have missed quite simple chances. "We will look at it on the screen and address certain things and move on from it and try to put a team and a system and a shape together and get ready for the next game against Watford on Tuesday." Match ends, Wolverhampton Wanderers 5, Rotherham United 0. Second Half ends, Wolverhampton Wanderers 5, Rotherham United 0. Danny Ward (Rotherham United) is shown the yellow card. Attempt missed. Rajiv van La Parra (Wolverhampton Wanderers) right footed shot from the left side of the box is close, but misses to the left. Assisted by Kevin McDonald. Attempt blocked. Paul Green (Rotherham United) left footed shot from outside the box is blocked. Assisted by Kirk Broadfoot. Attempt saved. Conor Sammon (Rotherham United) left footed shot from the centre of the box is saved in the centre of the goal. Assisted by Jonson Clarke-Harris with a headed pass. Substitution, Wolverhampton Wanderers. Kortney Hause replaces Scott Golbourne. Substitution, Rotherham United. Conor Newton replaces Adam Hammill. Goal! Wolverhampton Wanderers 5, Rotherham United 0. Bakary Sako (Wolverhampton Wanderers) right footed shot from the right side of the box to the bottom right corner. Assisted by Rajiv van La Parra. Substitution, Rotherham United. Jonson Clarke-Harris replaces Matt Derbyshire. Corner, Rotherham United. Conceded by Dominic Iorfa. Goal! Wolverhampton Wanderers 4, Rotherham United 0. Dave Edwards (Wolverhampton Wanderers) header from a difficult angle on the right to the bottom right corner. Assisted by Bakary Sako with a cross following a corner. Corner, Wolverhampton Wanderers. Conceded by Richard Smallwood. Attempt blocked. Bakary Sako (Wolverhampton Wanderers) left footed shot from the centre of the box is blocked. Assisted by James Henry. Attempt saved. Conor Sammon (Rotherham United) header from the centre of the box is saved in the bottom right corner. Assisted by Adam Hammill. Offside, Wolverhampton Wanderers. Kevin McDonald tries a through ball, but Rajiv van La Parra is caught offside. Attempt saved. Conor Sammon (Rotherham United) header from the centre of the box is saved in the centre of the goal. Attempt blocked. Adam Hammill (Rotherham United) right footed shot from outside the box is blocked. Assisted by Danny Ward. Attempt missed. Bakary Sako (Wolverhampton Wanderers) left footed shot from outside the box is high and wide to the left. Assisted by Kevin McDonald following a set piece situation. Rajiv van La Parra (Wolverhampton Wanderers) wins a free kick in the attacking half. Attempt missed. Matt Derbyshire (Rotherham United) header from the right side of the six yard box misses to the left. Assisted by Danny Ward with a cross following a corner. Substitution, Wolverhampton Wanderers. Kevin Doyle replaces Nouha Dicko. Substitution, Wolverhampton Wanderers. Rajiv van La Parra replaces Benik Afobe. Corner, Rotherham United. Conceded by Tomasz Kuszczak. Attempt saved. Adam Hammill (Rotherham United) right footed shot from outside the box is saved in the top right corner. Assisted by Ezekiel Fryers. Corner, Rotherham United. Conceded by Bakary Sako. Goal! Wolverhampton Wanderers 3, Rotherham United 0. Benik Afobe (Wolverhampton Wanderers) right footed shot from the right side of the box to the centre of the goal. Assisted by James Henry with a through ball. Attempt blocked. Matt Derbyshire (Rotherham United) right footed shot from the centre of the box is blocked. Assisted by Danny Ward. Attempt saved. Matt Derbyshire (Rotherham United) header from the centre of the box is saved in the top left corner. Assisted by Ezekiel Fryers with a cross. Richard Smallwood (Rotherham United) wins a free kick in the attacking half. Attempt missed. James Henry (Wolverhampton Wanderers) right footed shot from outside the box misses to the left. Assisted by Dominic Iorfa. Adam Hammill (Rotherham United) is shown the yellow card for a bad foul. Richard Stearman (Wolverhampton Wanderers) wins a free kick in the defensive half.